The Reserve Bank of India left repo and consequently reverse repo rate unchanged at 7.75% and 6.75% respectively. It also left CRR unchanged at 4.0%. This comes at a time when participants were debating over a 25bps or 50bps hike after steep rise in wholesale and retail inflation. Every governor has been peculiar in decision making and Mr. Rajan is no different. After an extreme uptick in WPI and CPI, primarily on the back of food articles, market more or less priced in a hike of at least 25bps with a tad hawkish stance. Food article inflation which has been a structural issue is hovering in double digits since 11th five year plan. Last dozen of data shows this is continuing in the next five year plan as well. Rajan from start is pretty clear over its objective to tame inflation and inflation expectation. RBI’s decision of status quo is drawn from steady core inflation. They believe food and vegetable prices will soon come off bringing down the headline wholesale and retail inflation substantially. RBI said that at a time when uncertainty surrounding short term path of inflation is high, and given the weak state of economy there is merit in waiting for more data to reduce uncertainty. More importantly RBI said it will be vigilant and check if the expected softening of food inflation does not materialize and translate into a significant reduction in headline inflation in the next round of data releases failing to which the Reserve Bank will act, including on off-policy dates if warranted. 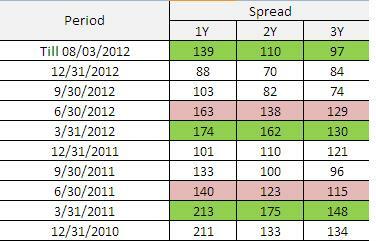 RBI’s action pulled down yields considerably down by ~12bps from ~8.90% to ~8.78%. Aggressive buying was limited as rate hike risk still persists after RBI clearly stated to act on off-policy dates as well. Short term CD/CP rates receded after RBI’s surprising move. 2M/1Y CD rates fell ~30/15bps. Banks and corporates aggressively jumped in the market to raise funds via CDs and CPs respectively. Frugal government is expected to keep liquidity tight for a prolonged period. Coming Inflation and growth numbers will hold a key importance in RBI’s decision making process. Anecdotal data suggests that vegetable prices have receded by ~40-60% m-o-m in early December. This if continues can bring down next number considerably down compelling RBI to keep rates untouched. Bond market has taken a hit from a number of domestic and global factors. OMOs, which mightily supported bonds in the second half, are almost absent. Fiscal worries as well are driving investors jittery to some extent, this is even after Chidambaram succeeded in limiting previous year’s deficit at announced level. Traders will wait for an update from US over its quantitative easing programme using which it had added more than a trillion dollars in the financial system. Strong pullback in its buyback quantum will be negative for the economy however the impact is not expected to be severe on the bond side. Note that FIIs cumulatively has sold bonds worth ~835bn since 22nd may when Fed first hinted pulling back its stimulus. Banks are the biggest investor in the government bond market (holding ~34.5% of outstanding papers). Low interest among banking community to maintain high SLR indeed affects bond prices. Recent spike in yields can be attributed to RBI’s hawkish stance (fear of rate hikes), less OMO expectation, global factors and unfavorable demand supply dynamics. RBI releases Investment to deposit ratio on a fortnightly basis. Recent numbers stands at ~29.8%(Oct 18, 2013) i.e. out of every 100rs deposit, banks invest ~29.8 in mandatory securities as specified by the RBI from time to time. This ratio is fairly low compared to same period previous year. Investment to deposit ratio as on Oct 19, 2012 was seen at ~30.7%. Normally banks increase SLR holding during uncertain and low growth bouts. Current situation should compel banks to keep investment to deposit ratio high. However that is not the case. This deciphers bank’s fear of taking a hit on P/L due to undue volatility in bond prices. If banks were to maintain a year before ratio of ~30.7% then probably excess demand of 730bn (~15% of net FY14 borrowing) would have supported gilt prices considerably. Japan – Yen appreciated substantially in mid June as investors feared BoJ will not be able to deliver bold monetary steps as promised. Soon after a steep YEN appreciation, dollar showed some strength on the back of easing geopolitical tensions. 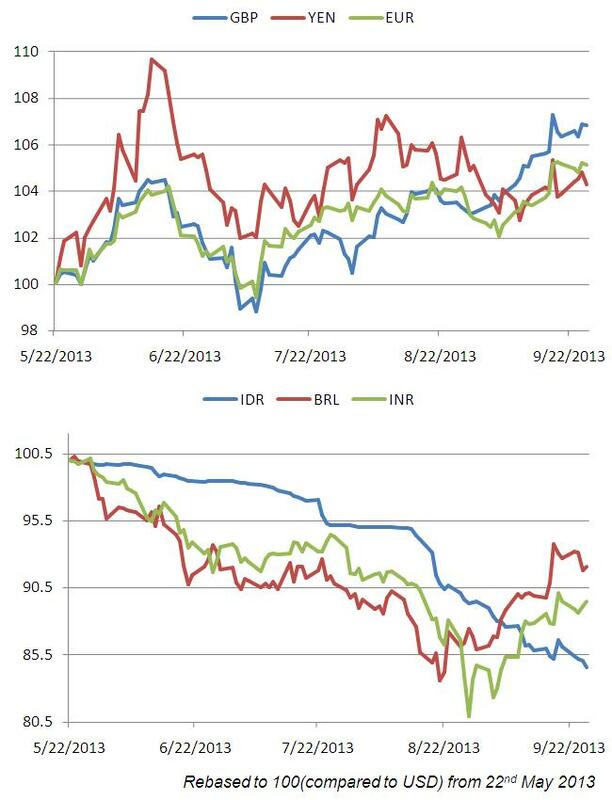 Indonesia – Indonesia has been in news for its surprising rate hikes to counter fund outflows. Even after subsequent rate hikes and stern steps to contain CAD (Similar to our level) rupiah still continues to remain weak primarily on the back of Central bank’s interference in reporting numbers i.e. they were seen deliberately publishing overvalued number. Brazil – Sentiments reversed for Brazilian real when its central bank announced intervention programme worth some $60bn in conjunction with rate hikes. Central bank intervened heavily in derivatives market by supplying dollars. India – It was the announcement of FCNR (B) swap window which helped rupee prop up substantially. Dollar swap window for Oil marketing companies was also among the important stabilization step. Steps on export promotion from New delhi will contain speculative dollar demand. Below is the print screen from FIMMDA’s Document which enumerates circuit filters. Number below band applicable column is in terms of Yield (bps). FIMMDA’s release is as on 25th march 2013. Taking press release date in consideration they have tried explaining above numbers with an example. Look for revised band. Important Element : Further, on days on which RBI’s Monetary Policy/ Union Budget are announced, the Trading Bands shall not be in Operation. It is the month of Jan, Feb and March when CD issuances rise manifold. Corporates demand funds from banks for working capital requirement. Corporates also buy funds for plant and machinery to enjoy depreciation benefit. Hence banks fall short of money and raise funds via bulk deposit at higher rates amid tight liquidity for funds. Short term rates rises so it is well understood that banks won’t borrow funds at 8.5-9.5% to invest in bonds yielding nearly same return. This reduces demand for corporate bonds and hence spread widens substantially. Soon as and when liquidity improves (which brings down short term rates as well) spread narrows.